Hibernian manager Pat Fenlon is "hopeful" of signing Scott Robertson from Blackpool before the closure of the January transfer window. Robertson, who left Dundee United last summer, has played just once for the Championship side this season. The 27-year-old previously played for United's city rivals Dundee. "Until these things are over the line, you're always wary that something may pop up but we're very hopeful we can get it done. "Hopefully, we should be able to get something done in the next 24 hours." The point at Pittodrie keeps Hibs one place ahead of Aberdeen in the Scottish Premier League with a two-point advantage and Fenlon admitted he was glad to have kept a clean sheet. Aberdeen dominated most of the match and could have been one ahead in the 11th minute, but Niall McGinn's spot-kick was saved by Hibs keeper Ben Williams. "We're delighted," said Fenlon. "We were hanging on and never really got to the levels we expect of the team, but we've picked up a good point and haven't conceded a goal, which are the positives to take out of the game. "We defended quite well and stuck at it. "The pitch is not great and not conducive to any real football. But we have to get better and start games better than we did today." A notable absentee from Fenlon's starting line-up was Honduran Jorge Claros, whose loan spell from Motagua is nearing an end. Fenlon said the player had been unsettled amidst transfer negotiations, but is hoping to secure a deal to extend the midfielder's stay in Leith. 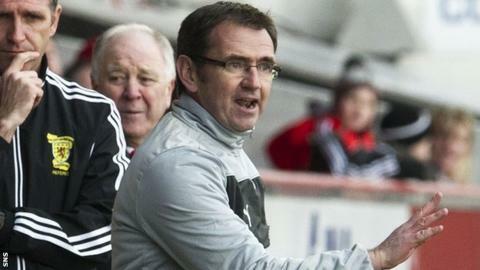 "It hasn't been sorted at the moment," said Fenlon. "We left Jorge out because we had a long chat with him yesterday and his head is probably not right at the moment in relation to football. "You're talking about a lad's personal life and his family, so we're trying to sort it out as best and as quick as we can. "It's just taking longer than we thought. I just didn't think he was in the right frame of mind to play."